On this day and time Sgt. Vogel and two of his CO’s entered the short corridor with a list of names of guys from all racial groups in which they went door-to-door informing them that they were moving immediately--no if’s, and’s, or but’s--willingly or by force!!! When a thing’s small, at its beginnings, it is easily uprooted or destroyed... A seed is much more easily uprooted than a tree. But this evil that plagues us is centuries old; a gnarled tree with thick canopy, many branches, and deep roots—but if we are to remove this “tree” so the “sun” of organizational success can reach us again—we must wrest this vile tree up by its roots, we must strike at its origins. 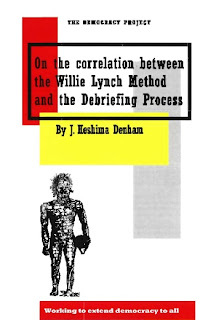 Acknowledging the William Lynch Method as the true origins of the debriefing process is the key to halting its affects upon imprisoned revolutionaries. By being aware of the subtle psychological effects of the William Lynch Method that vibrate through the undercurrents of the decisions being made by imprisoned revolutionaries which are hampering our collective efforts, we can begin to devise and implement successful psychological counter measures and operational procedures which will forestall this vile evils’ effects on our Cause and finally sever this centuries-long link with the slave mentality.